Taking temperatures is essential for checking the health of pigs, sheep, and other animals, and livestock thermometers offer convenience and accuracy. They come in both digital and non-digital models, and they don’t contain mercury, which makes them safer to use on both pets and livestock. Along with needles and syringes for delivering vaccines and medications, animal thermometers are a part of everyday animal healthcare. We offer many other products for keeping livestock healthy, such as rumen magnets to prevent hardware disease in cattle, hoof care for horses, and disinfectants to keep pens clean and sanitised. 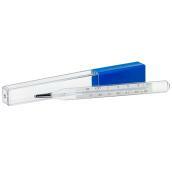 Non-Mercury Thermometer - °F - 5"